Arianna Huffington has placed her busy little fingers into another pie, adding “publisher of e-books” to the Huffington Post’s lengthy list of functions. 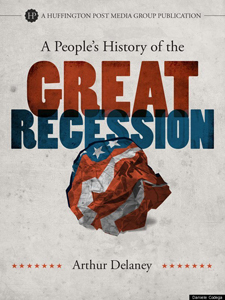 The release of A People’s History of the Great Recession marks the blog’s first venture into ebook sales, and the inaugural entry will be composed of previously published HuffPo pieces. Huffington herself discusses the title at length in a post on HuffPo, describing her “obsession” with the downfall of the American middle class in 2009 when she approached author Arthur Delaney to write to book. A People’s History of the Great Recession‘s launch will be followed up by a second title from HuffPo, Aaron Belkin’s How We Won, focusing on gay rights. Both books will be priced at a palatable $4.99, and the writers will be paid in a cut of profits. Since the cost of publishing is minimal — mainly the time that staff writers and editors put into it — the financial risk is not great, Huffington said. Delaney… and an editor did most of their work in a shared Google Document… books will be promoted prominently on the HuffPost website, Huffington said, which means no additional cost for marketing. The titles will be available through Amazon, Barnes and Noble, Apple, and Kobo.